Ask fellow campers about "Yakima River RV Park" and nearby attractions. Question: In answer to some of our guests concerns about the "SECURITY GATE". It really is not intended for that purpose but is is there because with the added volume of campers on the road, we were having a problem with RV's and tenters arriving after 9:00, or even after midnight, and waking our guests with loud talking and diesels idling while setting up. We apologize for the inconvenience of a gate, but feel it is far less inconvenient than being roused from a deep sleep at two in the morning by someone that arrives after normal business hours. Answer: I dont remember them having a gate maybe it is something new? This is a very clean well maintained RV park. The spaces are spacious with some shade. The park is very quiet with a country setting. The town of Ellensburg is only a couple miles away. The staff is friendly and very helpful. I would recommend this park to anyone planning to stop in this area. We camped at Yakima River RV Park in a Fifth Wheel. We found this RV park to be very nice, clean and quiet (a train once in a while). There is a ton of space between each site, which is SO nice to have because most parks cram you in like sardines. The sites are gravel with patches of (green) grass in between. I say 'green' because it has been so dry everywhere we've been in Washington that 'green' was a pleasant surprise. Utilities were placed well and worked fine. We were parked on the back row next to a pasture of horses and cows. It was very pleasant and relaxing. Wifi even worked pretty good. Although this was a delightful park we felt we were handed pages of rules. 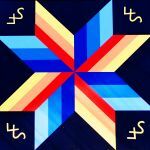 All, or most, of these rules are standard and common courtesy, but to have them all written out so that when you look at the page you wonder if you're allowed to sit outside or put your awning out. Of course you are, but the you get the drift. The other thing that was cumbersome was the entry gate. It's one of those gates that you put in a code and sit there for a few minutes while it opens sideways. There are quite a few speed bumps at the entrance where that gate is so don't get caught in it while easing over the speed bumps. The park is out in the country and near a relatively small town. I don't understand the need for this mega security gate that is in the way. We camped at Yakima River RV Park in a Fifth Wheel. This is now a gated RV park which has drawbacks when you have visitors. Check in time is 1:00 which means you may have to wait somewhere like we did as our last park was only 1 hour away and we had to be checked out of there by 11. However, it is a clean, well maintained park and close to Ellensburg. We would stay here again as we have family here. The spaces are wider than in years past which is very nice. Great camp hosts. We camped at Yakima River RV Park in a Fifth Wheel. Newer park with limited sewer hookups and small trees. Nice pull through sites with 50 amp service, level gravel pads, and grass between each site. Located next to the Yakima River in a scenic valley. Two nice sized grassy dog parks and a field. Expect lots of wind in the afternoons in Ellensburg. There is a dump site down the road. 5.00 for second dog. I would stay here again. We camped at Yakima River RV Park in a Fifth Wheel. Great place if you are floating or kayaking on the river. Close to town. No freeway noise. Occasional train. The RV park is in a flood plain, so it is not permitted for dump site or showers/rest rooms, but is serviced by porta-toilets that are cleaned regularly. There is a city dump site two miles north of the park that has a large turnaround and water available. The sites are 36'x70' in the partial service area and have picnic tables and fire pits. There are rodeo bulls in the field, and a wonderful view of the Stuart Mountains to the north, and a very short walk to the river. The park has been expanded so all sites are large and roomy. Prices were at or below other parks in the area, and is well maintained. Camp workers are very friendly and show you to your site. The roads are gravel, but wide enough to navigate with the largest of RVs. Train crossing is about a half mile away, but noise is not obtrusive. Will definitely stay here whenever we travel the I-90. Make reservation, as park tends to get busy in the summer, especially on weekends. An office just opened, so stop at the office to register/check in. Gate closes at 9:00 PM to prevent late arrivals from waking you up in the night-time hours. We camped at Yakima River RV Park in a Fifth Wheel. This campground has the cleanest campgrounds that I have stayed at. Very nice river sites and very clean park. The new owners are so nice! We camped at Yakima River RV Park in a Travel Trailer. Call ahead of time if you want a certain spot. The park has been enlarged since we were here before and there is a nice long RV spot now. the hosts are still the friendliest people who guide you to your site. I never met the owners. The only draw back is the lack of restrooms which I believe may be impossible to build so close to the river. We would certainly go back for the price and friendliness and now the longer spaces. It is a little bit of a challenge to get out pulling our toad. We camped at Yakima River RV Park in a Motorhome. We stayed one night on our way out of the Seattle area. The camp host met us at entrance and pre-paid check-in took about a minute using a smart phone. He was friendly and guided us to our P/E only site. Gravel roads and site. Level and very wide with a wide grass separation. WiFi was slow. Only noticed the trains once. We camped at Yakima River RV Park in a Motorhome. We stayed here for 3 nights. I think it is the best park in the area. It is a very clean park with grass and trees around you. We chose a site with the full hookups. It was $3 a night more but well worth it. We originally were only going to stay two nights but could not find another decent park near where we were going. I would highly recommend this park if you are anywhere near this area. There is a train track but never were bothered by loud noise. Whistle seemed to stop at night. Sites are fairly close but the way they are situated works well. Would definitely pick this park if in the area again. We camped at Yakima River RV Park in a Motorhome. We stayed a quick overnight on our way to Seattle based on the previous reviews. Ditto to previous reviews. Camp host met us at entrance, very friendly and helpful, and indicated that credit card was okay even though we offered cash. However only one person was allowed to do the credit cards and that is apparently the owner. We were told she would come by our trailer as soon as she returned from a day of swimming. Didn't show up until after 8 p.m. and then preferred cash due to the cc paperwork and also that we had already gotten half off. Other than that it is a pleasant, clean, handy place to stay even without the sewern bathrooms, or showers. The trains did not present a problem to us. Only heard one horn all night. We camped at Yakima River RV Park in a Motorhome. CG manager was very congenial and helpful; can't say enough positive things about her. However, a commercial campground that does not have restrooms and showers should not be charging the same amount as those that do. They do have 3 port-o-johns instead of bathrooms. Ugh! 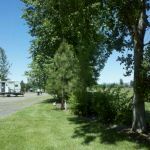 We camped at Yakima River RV Park in a Motorhome. Clean no shade grass between spaces. Wi-Fi well it worked some what the first day and nothing for the next two days but worked the 4th day You have to watch out for the speed natze camp host The speed limit is 5 and if you do 5.5 she jumps all over you. How she can tell a 0.5 mph she must have special powers. Owner was friendly as with the rest of the crew No sewer in the newer part who knows why?? We camped at Yakima River RV Park in a Fifth Wheel. You never know what you're going to get with Passport America but this was probably the nicest PA park we've visited. Very very level. I would have given it a 10 but they advertise FHU but the guy told us no sewer when he brought us to our lot. This was the new section so they might not have sewer hooked up yet. And no cable. Beautiful park. Easy to find. You will hear trains though. Also, we were told they would not be PA next year. We camped at Yakima River RV Park in a Motorhome. This campground frequently does not receive the high ratings that it deserves- because there are no showers or bathrooms. 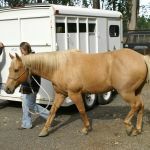 Typically, the rigs and campers are large enough to be self-contained. In the event there are people who would like to tent camp, there are very clean port-a-potties. The grounds are well-maintained and the sites are very large with a picnic table and fire ring. The Yakima River is close by and it is a very peaceful setting. We camped at Yakima River RV Park in a Travel Trailer. Ellensburg is is cute college town. Many shops and restaurants. We attended a 3-day jazz and blues festival and the music was amazing! It is always the last weekend in July. This was the 20th year for this festival and it is extremely well-run. Fishing on the Yakima River is prefect for fly fishing. Our favorite restaurant is The Porch. Go into Ellensburg, a pretty, little, very neat looking town. Avoid the Texas Roadhouse Restaurant though...we went The and the service was so bad we left after we couldn't get service at our table. Others were waiting also. DO go to The Palace Cafe just a few blocks up the street. Very nice restaurant, good service and good food. When we left the park, our GPS took us down a road to the next interstate and the entrance was closed...had to backtrack 5 miles to get onto I-82eastbound. Ellensburg is just a 5-minute drive. Lots of local charm and great eating establishments. There are several local fly fishing shops that offer guided float fishing trips on the Yakima River. The RV park is in the Yakima River wetlands - so there are mosquitoes that are in the park late in the afternoon / early evening. Checkout the new video clips on the park website - great fly-over views! Grocery stores are a few miles away. Plenty of restaurants, too. Interesting location on working ranch so you can see horses and cattle. They have two fenced in dog areas and are very fussy about not letting dogs go to bathroom anywhere other than those two areas. Ellensburg has a decorated barn trail to follow, nice way to see the area. Fishing on the Yakama. Rafting too, good pull out spot just downriver from the camp site. Just down the road at I-82 is a good truckstop, food & gas, RV parking. The local museum and the Clymer Museum are great. 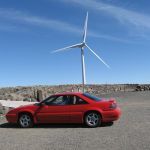 A trip to Vantage to see the petrified logs and the wind farm is something else you can do. Lots of rafters in the area. River rafting, kayaking and maybe fishing about the only thing to do nearby. Park does offer shuttle service for kayaking which we did use on a previous visit. Wind farm tours nearby. Quilt pattern on barns map in area. We attended the dachshund parade and races last time we were here in June which was a hoot. We kayak and bike and prefer to not be on the freeway. This is the only option, and one of our favorite places. Are you affiliated with Yakima River RV Park ?